Grilling Whole Alligators: A New Pre-Game Event? When it comes to college football, over the top pregame rituals are nothing new. Fans show up hours before the game to partake in a range of activities. With grilling being a major part of almost any pregame at the stadium, some football fans are looking to start a new tradition that is both a major feat of grill work and a bit of a jab at the opponent. 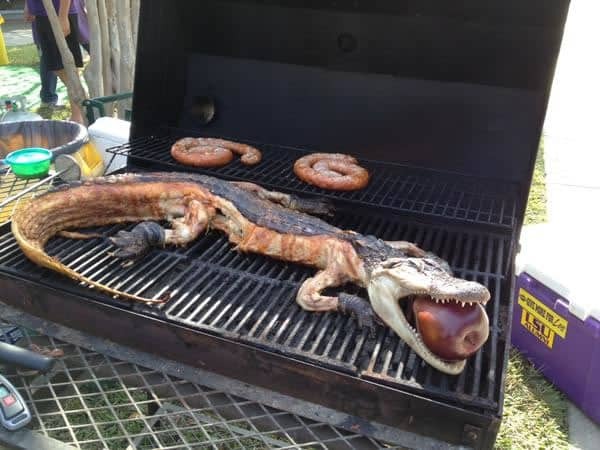 With the Florida Gators coming to town earlier this year, fans of the LSU Tigers decided that their pregame festivities should include whole alligators cooked on the grill. 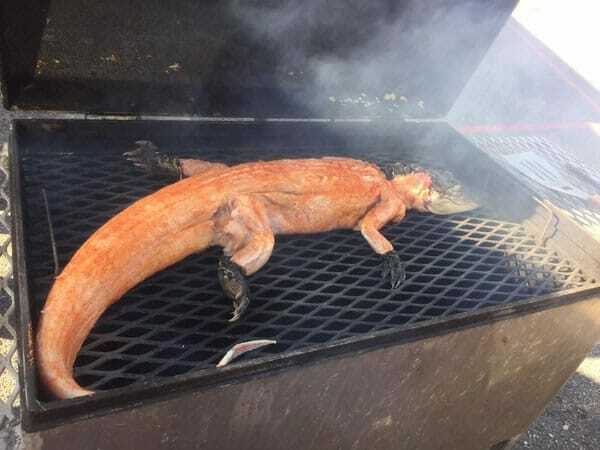 Of course, grilled alligator is nothing new in Louisiana, but adding this to the pregame ritual sends a message to the visiting team and it is a great way for a serious barbecue chef to show off his or her skills. After the LSU fans grilled some gator for their meeting with Florida, some fans in Georgia followed suit when they welcomed Florida for a game. For a game time celebration at Sam’s BBQ in Cobb County, barbecue chef Sam Huff grilled up a 7-foot alligator. As a fan of UGA, this is the third year where Sam has marked the game with Florida by grilling a whole gator. Fans can come by for gator tacos, gator straight off the grill or some fried alligator. In both cases, it looks like a great way for people to have some fun before the game and possibly try something that they may have never eaten before. For many, the thought of grilled alligator might not sound all that appetizing, but most of the people trying it at the pregame events said that it tastes like chicken. With the practice starting to grow in popularity and it being a good attention getter, it seems that it is very likely that this could be the new pregame tradition for a variety of teams that play the Florida Gators.